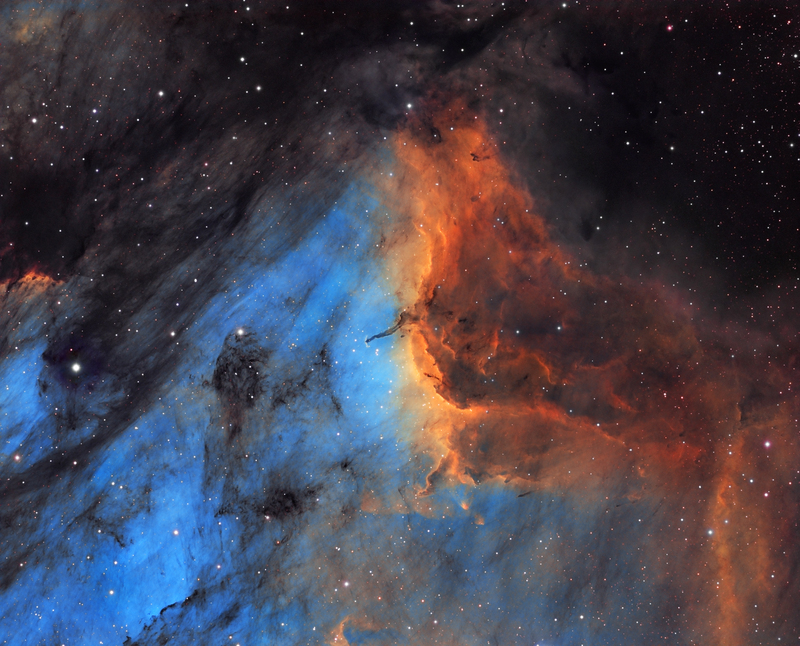 Exposure: 180 min Luminance, 180 of each RGB, 450 HA, 300 O3 "for each panel of the mosaic"
NGC 6992 is the eastern half of the Veil Nebula, a supernova remnant in Cygnus. 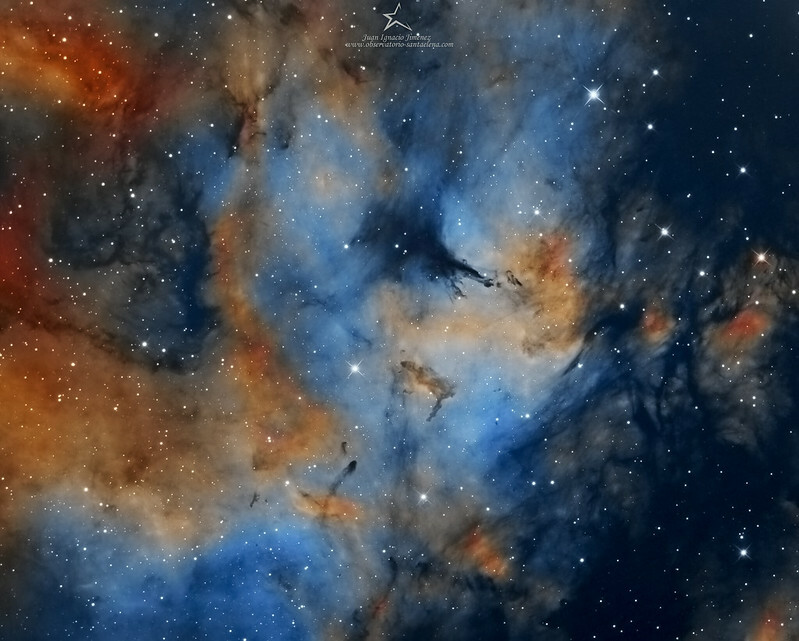 Its catalog designations are NGC 6992, NGC 6995 and IC 1340. 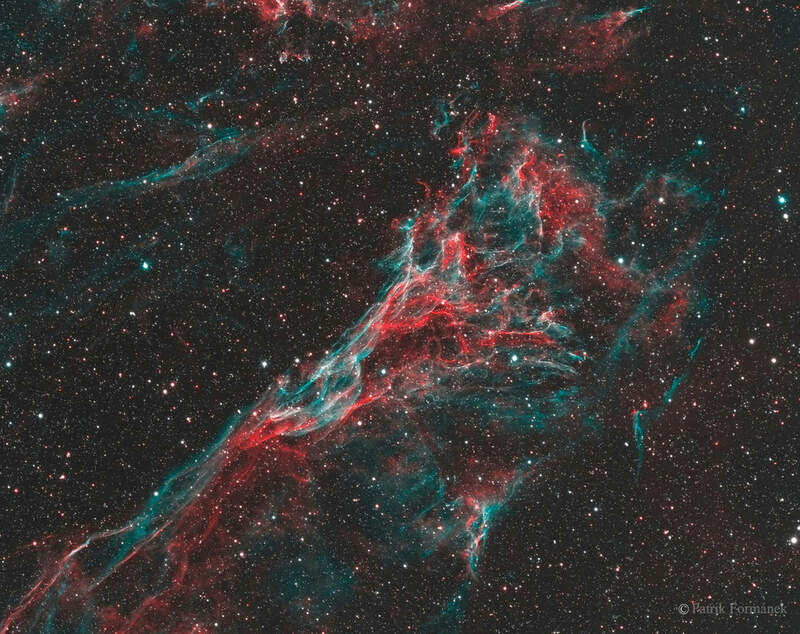 This bright portion of the Veil Nebula is also known as the Network Nebula. The supernova explosion that created the Veil Nebula occurred 5,000 to 10,000 years ago. It is located 1,400 to 2,500 light-years away in the constellation of Cygnus. 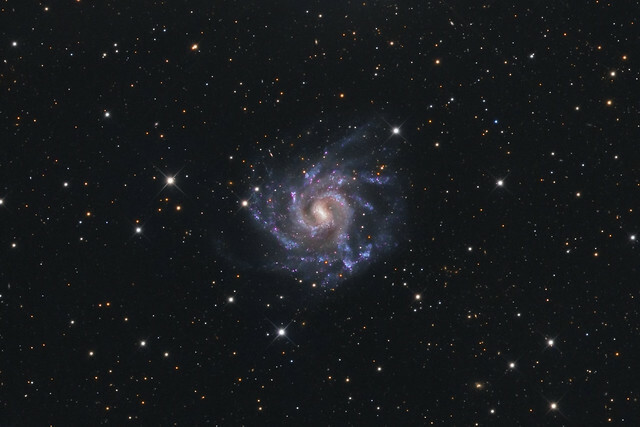 In the constellation Grus, a beautiful face on Grand Design Spiral Galaxy can be found. It is approximately 37.5 to 40 million light years away from us, with an apparent size of 9.5 X 8.1 arcmin. It is worth noting that the structure and diameter are very similar to our own galaxy, the Milky Way. It takes 100,000 years for light to reach across this galaxy, and it is receding at approximately 930 kilometres per second. 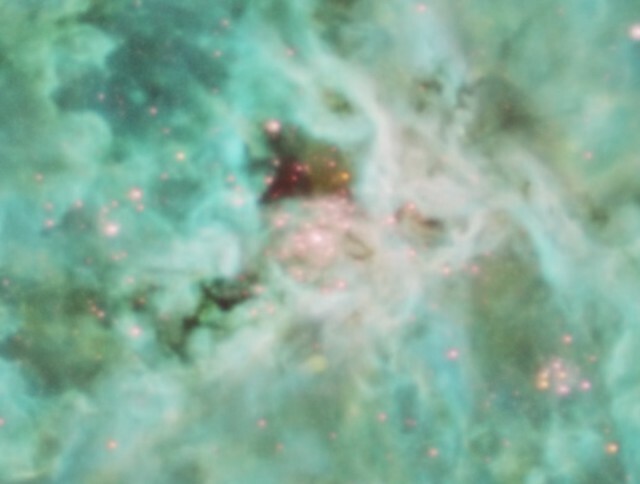 The very bright prominent bar in the middle has a slightly more reddish colour suggesting an older population of stars are located along the bar. As you more outwards, the galaxy takes on a bright blue colour. 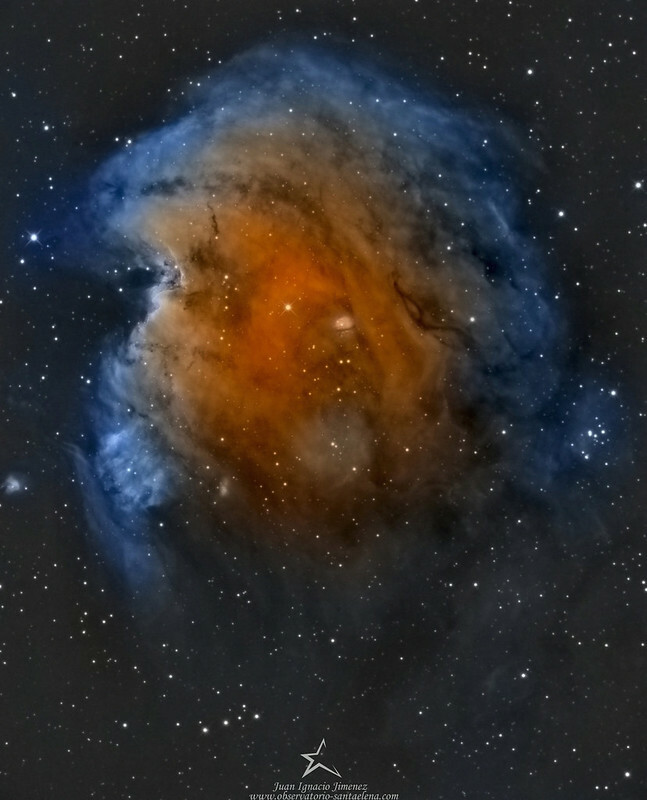 This colour is the result of ionized hydrogen regions, with clusters of young and massive stars. 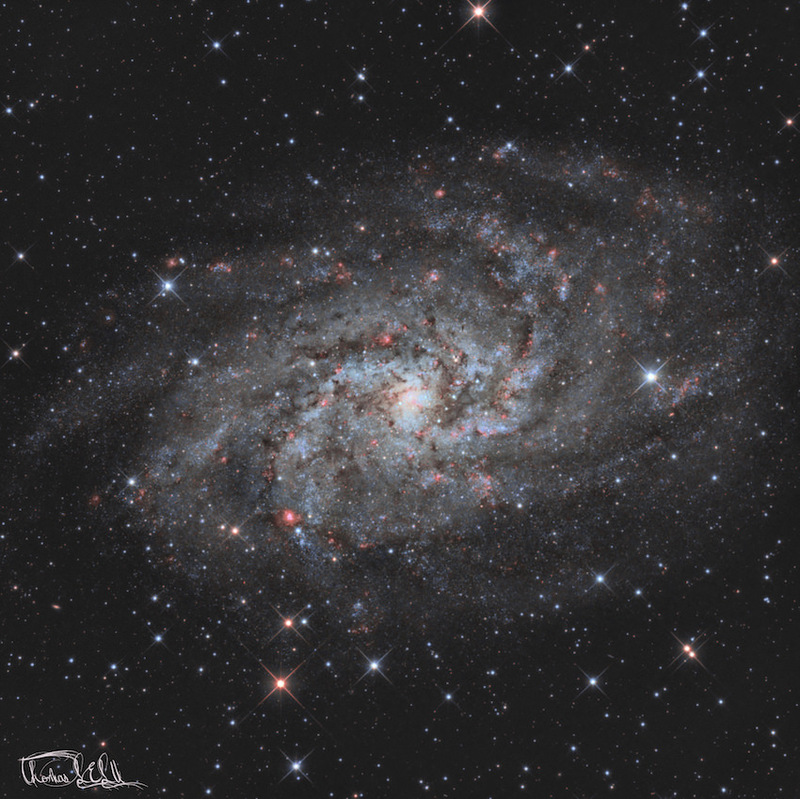 NGC 7424 has a low surface brightness, and best viewed in dark skies. Viewing this incredible object through a small instrument will yield an elliptical haze devoid of the many arms present in the image above. Best viewing of this object is from late September, October, and into November. Field of view ..... 33' 5.5" x 22' 3.9"
Last edited by bystander on Sat Nov 03, 2018 4:20 am, edited 1 time in total. Last edited by Patrik Formanek on Sat Nov 03, 2018 1:26 am, edited 1 time in total. 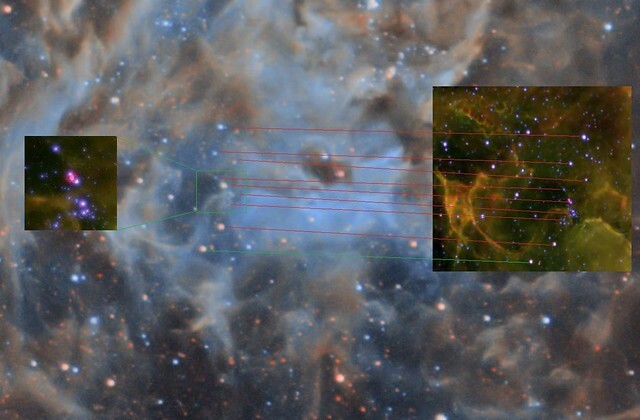 I love your SN 1987A identification, Rafael! Your Tarantula picture looks good, too. But where is R136, the huge cluster ionizing the Tarantula? I can't spot it at all. And what is that deep red spot which is probably not far from R136? 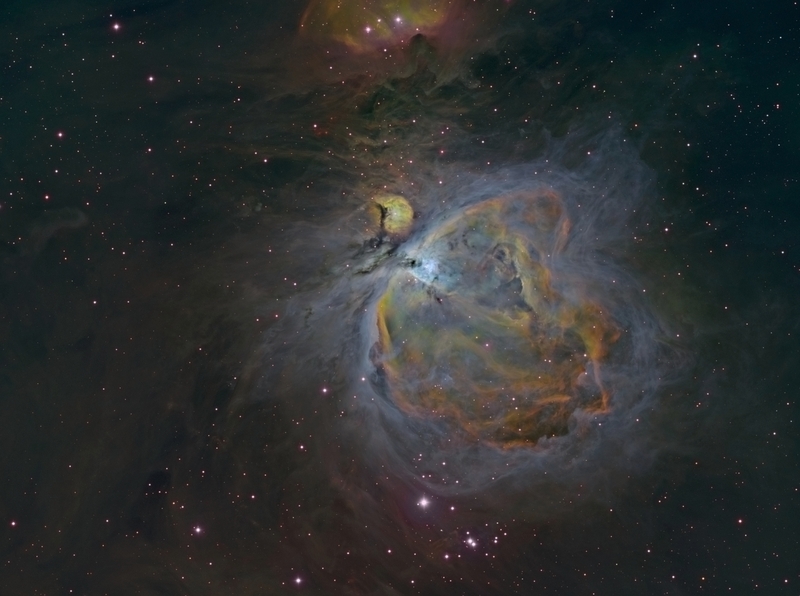 The R136 cluster has gone AWOL after the HDR and color calibration for some reason. the galactic center of the Milky Way, an illuminated cloud, Jupiter (left), Moon and Mars (right). Observed between Grünau and Keetmanshoop, Namibia. July 27, 2018. This is Comet 21P/Giacobini-Zinner and open cluster Messier 50 imaged remotely, on October 7th, 2018, from the Siding Spring Observatory, New South Wales, Australia. 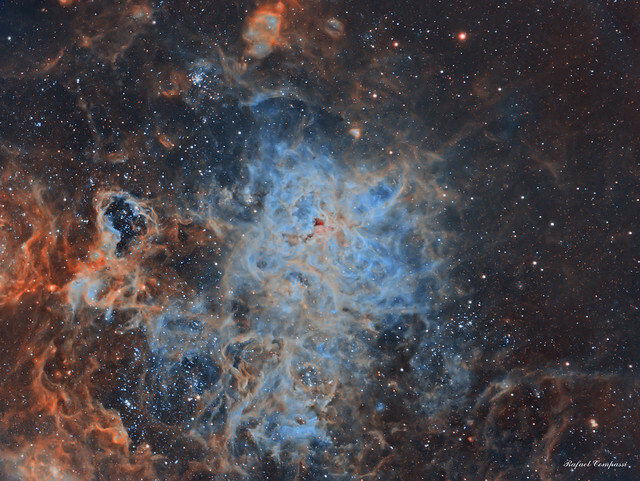 Total imaging time: 18 minutes through LRGB filters. 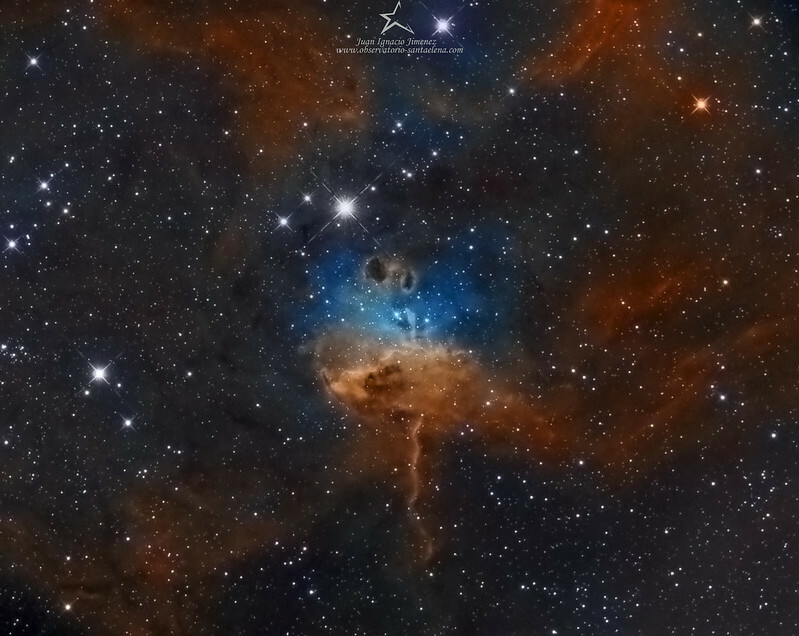 iTelescope T31 was used for the Luminance data and T32 for the RGB data. 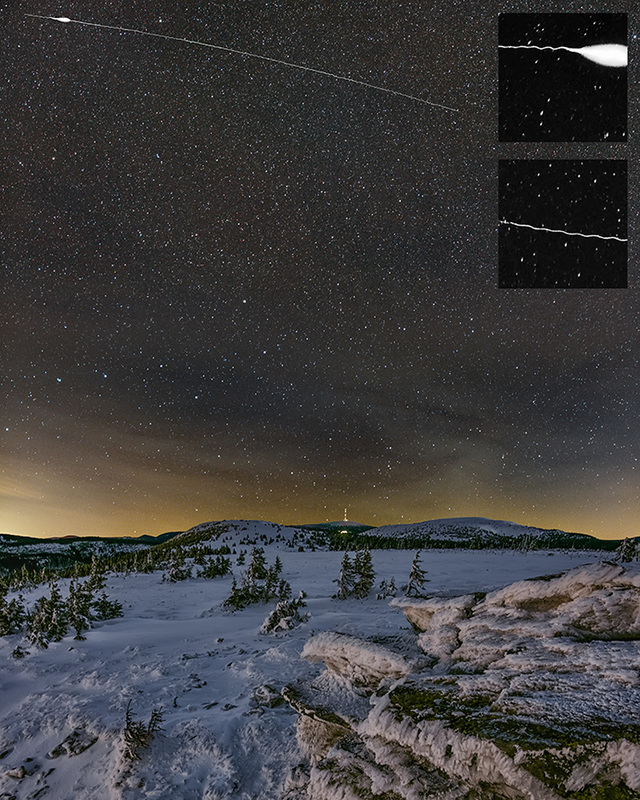 Iridium flares and atmospheric seeing - Iridium 60.
location: Jeseníky Mountains in the Czech republic. in the picture is: Trajectory of the satellite flight path affected by Atmospheric seeing. Landscape: 12 photos, 3x EBKT, ISO 3200, f / 3.2, 188, 38 and 8s. Stars: 48 frames, 2x flat, ISO 12800, f / 2.5, 15s. Original dimensions: 5819 x 8148 pixels. NGC 467, 470 and 474. KG Observatory, Julian CA. Image made with the camera + lens. M31 is located in the constellation of Andromeda and is best observed in November. Galaxy can be seen with the naked eye. Because it is so easily observed in the night sky, it is impossible to tell who discovered the Andromeda galaxy. However, the book of fixed stars of the Persian astronomer Abd al-rahman al-Sufi of 964 contains the first known report of the object. 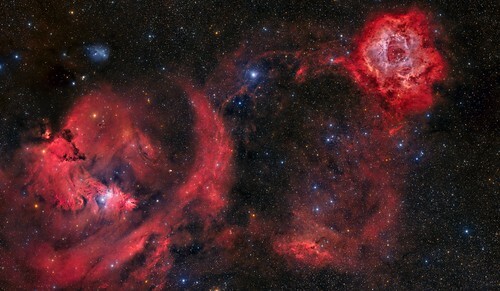 That's a great portrait of an amazing shell galaxy and its neighbors! The picture shows NGC 474, the shell galaxy, to be relatively neutral in color. The starforming ring galaxy, NGC 470, is seen to be quite blue, and the elliptical galaxy NGC 467 looks rather yellowish. And indeed, the colors that we see in the picture are really spot on, when you check the B-V and U-B indexes of these galaxies! We can conclude that NGC 474, the shell galaxy, has undergone at least one merger event that led to widespread star formation. Now the stars that were born in that burst of star formation have grown old enough that their light is no longer blue, but their combined light is not red or yellow, either. But the elliptical galaxy, NGC 467, has seen no widespread star formation for a long time, and its light is yellow. I'm usually no fan of Hubble palette pictures, but I love the mapped colors that are used here. I find the picture exquisite.